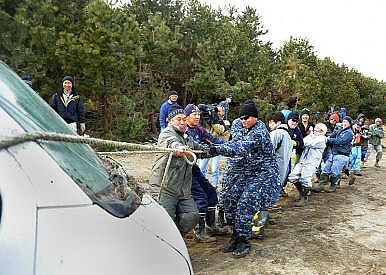 As it recovers from disaster, Japan has a huge chance to tackle issues vital to its future security. But it will need leadership from the next generation. Franklin Delano Roosevelt entered office in the midst of an historic internal disaster, the Great Depression. But although FDR exuded the confidence to inspire a nation, he lacked a clear plan for action. Instead, the 31st US president experimented—and experimented with a vengeance. In the words of Pulitzer Prize-winning historian Doris Kearns Goodwin, he hewed to the ‘faith that the right solution to a vexing problem would eventually turn up.’ The result was a New Deal that renewed a paralyzed nation. Japan faces a unique but similarly monumental internal challenge. After the calamity of 3/11 subsides, Japan will require a New Deal to restore a nation. Business as usual won’t suffice. Once the immediate nuclear dangers are contained, a new type of politics will be needed and expected. If Japanese leaders simply rebuild what has been destroyed, they will have missed a once-in-a-lifetime opportunity for leadership. As US Secretary of State Hillary Clinton visits Japan this week, she will praise the Japanese people and our alliance cooperation. She should also encourage younger Japanese leaders to learn from FDR: they shouldn’t wait for customary central plans to be finalized, but instead should put in motion the best ideas available now to help the Japanese people avoid turning down and inward. She should also encourage them to focus on priorities, because in the wake of disaster a multitude of well-intentioned ideas have been broached, but without any sense of implementation whatsoever. Prime Minister Naoto Kan deserves full support during this present crisis. But the responsibility to motivate, innovate, and rejuvenate Japan is likely to soon fall on the shoulders of the next generation of political leaders in the ruling Democratic Party of Japan. Younger DPJ politicians like Shinji Tarutoko, Goshi Hosono, Yoshihiko Noda, and Seiji Maehara (all under 55 years of age) must rise to this enormous responsibility. This won’t happen overnight. For perhaps the next year or two, Japan inevitably will turn further inward. Still, the major aspects of renewal will have clear international dimensions to Japan’s vibrant recovery. These pillars of renewal involve decisions about nuclear energy, military force, and health security—issues that were important before the disaster and are now even more profound. First, as Japan grapples with the question of its future reliance on nuclear energy, it has an opportunity to advance global nuclear safety and non-proliferation. The Three Mile Island release of radiation froze the nuclear power industry in the United States for some 30 years. Like Newton’s third law of motion, the force of the Fukushima crisis threatens to create an equal and opposite force that would freeze nuclear power in Japan. The subject deserves serious debate, and no one can or should dismiss lightly the threat of radioactive contamination. Yet alternative energy sources will be difficult to come by in the short-to-mid-term. It will be decades before alternative renewable sources of energy come onto the grid and are in a position to replace nuclear power as a major source of energy for a modern economy. Japanese self-confidence in their scientific and technological prowess is shaken. That is unfortunate and unfounded. The nuclear reactors appear to have performed as designed: shutting down and dropping fuel rods in cooling ponds as a result of the earthquake. The failure appears to have been in not contemplating a 9.0 earthquake followed by the massive tsunami that it would trigger. It was, after all, apparently the tsunami that destroyed the cooling equipment required to avoid a meltdown. The Japanese promises to conduct a thorough lessons-learned study that it will share with the world. It should do more than that. Japan needs to reassess the structure and oversight of its entire energy agency. It also needs to create a far more effective and centralized emergency-response agency akin to the US Federal Emergency Management Agency so that the government is fully prepared to undertake effective risk management and crisis response. Japanese officials should also commission a major international study about how civil nuclear programmes might be made less dangerous. There are under-developed and closed countries with or contemplating to build nuclear reactors, and almost all of them lack Japan’s technological and other safeguards needed to avoid potential radiation from both natural and man-made disasters. Unfortunately what happens in remote areas won’t necessarily stay in those remote areas. The earthquake and tsunami were preceded by major tremors in the country’s political system. Their continuation will help shape post-disaster Japan.